It's an IT manager's nightmare: You're tasked with setting up a videoconferencing room for your company or campus. Everyone seems excited about the room, but once it has been integrated, the equipment sits there unused and your finance department is questioning the expense. What went wrong, and how can you keep it from happening again? Before you even buy the room, make sure you understand what your users intend to do with it, says Jonathan Shor, director of technology of McCann Systems LLC, an AV design/build firm in Edison, NJ. "Videoconferencing rooms seem to be Ôthe thing to do' these days, and some clients will ask us for a room without any usage planning," Shor says. "Often, the people involved in the budget/design process aren't the people who are going to use the rooms - and these people don't talk with each other." Shor says his company has seen situations where the actual user isn't brought into the process until the room has been completed. "This person may have a comprehensive list of things he wants to do with the room and the room won't meet those needs," he says. The attraction of advanced technology can be a downfall. Planners envision their users coolly walking into a room full of high-tech "gadgets," activating a flashy touchscreen panel, and smoothly bringing up all of the equipment and remote sites for the meeting. In reality, many users find the technology very intimidating and the fear of "messing something up" will keep them out of the room. The lure of HD videoconferencing is an example of technology that everyone seems to want, but not everyone needs. "It is almost like we are back in the early videoconferencing days of the '80s with dedicated rooms that cost a half a million dollars to fit out," says Steve Thorburn, principal of Thorburn Associates, an acoustic and technology consulting company. "But I challenge clients to truly determine who they need to 'video' with before planning a room. We ask our clients, 'Who are you going to talk to and what do you need to share?' Once you know your position and can defend that, then the designers can help engineer the system and room that you need." 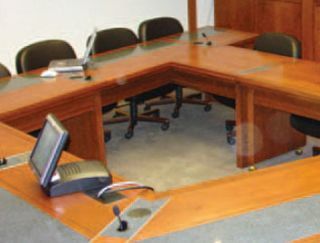 Thorburn notes that there are many standalone, off-the-shelf videoconferencing systems that may be perfectly adequate for the initial conferencing requirements of users. "Don't get seduced by the technology," he says. "You must walk before you run with the features. This is no different than trying to start your exercise routine with an ironman triathlon after 20 years of sitting behind a desk. If you try to do too much, regardless of best intentions, your team will fail." Ron Maus, a senior project manager in the Real Estate and Workplace Services group at a Silicon Valley high-tech company, concurs. He maintains that advanced technology should only be purchased based on the technical sophistication of the users. "There is no value to state-of-the-art if the user cannot understand how to initiate the device or how to use it to achieve their meeting goals," Maus says. "If a room is not being booked at our firm or there are repeat complaints about it, the complaints often focus on the failure to build out the room for intuitive use by the widest range of occupants." "Consider how you conduct meetings now, before purchasing your conferencing room," says Thorburn. "You'll need the same computer and graphic camera inputs and other devices that you are using now. If you use flip charts in your face-to-face meetings, you should start with being able to display those flip charts at the far end, then, as you are weaned to a more efficient video-based collaboration system, you might try application sharing or something as simple as using a document camera. No matter what, the system should match your work flow - not the other way around." Maus says his company provides videoconferencing facilities ranging from small systems to full training centers, and each room has been designed with a specific purpose in mind and a specific set of technology for the users. "Performance is relative to the room size," he says. For example, Maus says, small rooms may find value-add in tabletop projectors or LCD/plasma screens, limited lighting controls, mechanical shades as necessary, and decent voice conference capability. Medium-sized rooms could integrate "smart" panels, more flexible lighting and controls, advanced AV control, and possible upgrade to HD depending upon the predominant type of video source and material. Large and multi-purpose rooms open the door to all the "bells and whistles" based upon need and the users' technical sophistication. Another key to success, says Jonathan Shor, is putting in the right level of support for the people who will be using the rooms. "It's important to instill in the users' minds the fact that they need continual training," he says. "We warrant our systems for a year, including training sessions. After that year is up, we propose a service contract that includes preventative maintenance and additional training sessions." Shor says many companies will try to "make do" with the initial training but after a while, the personnel who were trained may leave the company and their expertise will be lost. A danger of losing that expertise, he says, is potential misuse of equipment. An example is the SmartBoard interactive whiteboard panel. Shor says this product, which shares whiteboard content between sites, can be an extremely effective collaboration tool for videoconferencing, but "if people aren't trained, we've seen this advanced piece of equipment end up being used as a marker board with the users having no clue as to its capabilities." If you've done your advance planning well and your conference rooms are getting a lot of use, Maus says you should consider hiring a third-party contractor to manage room reservations, catering, and support so that the rooms will operate more efficiently. "The firm we use [Sodexho] inspects and audits rooms before, during, and after use. They have a standard approach to obtaining needs from the user prior to booking them into a room," he says. Maus says another contractor is utilized at their firm to conduct full building occupancy surveys; this contractor collaborates with the room management contractor to identify situations where a user group might be trying to use a videoconferencing room for something other than its intended purpose. "If a user wants to do customer training, or set up a PC/server lab or some other non-conferencing use, our space managers will work with that user group to identify appropriate space other than a conference room," Maus says. With this type of management, he notes, the videoconferencing rooms at his company are in use constantly and are providing effective ROI for the company. "Once we are able to create an well-performing room for customers, it is heavily used and often taken on as a private room by an executive." In addition to usage planning and training issues, other aspects of the room's design must be considered. "The architecture, finishes, acoustics, cooling, and lighting should be designed to support collaborative environments," Thorburn says. Network connections must also be carefully considered; if your network will only support lower bit rate conferencing devices, don't try to implement HD right away. "When you look at HD videoconferencing, your connection to the 'communication cloud' [the internet] needs to be fast," Thorburn says. "You will need a T-1 data connection for HD and you will not have any bandwidth left for anything else - no VoIP, no internet, no VPN. Your clients need to be aware of this. You also need to make sure you have backward compatibility with sites that do not have HD capabilities. If not, your HD room may be useless for talking with non-HD sites." Ultimately, the key to success with a conference room - or any use of AV technology - is advance planning. Talk with your users to find out what they need, give them the tools they need to accomplish their goals, and train them on correct usage. The result will be a well-used facility and satisfied clients, with few questions about the investment. Elaine Jones is principal of Elaine Jones Associates, a independent marketing/PR firm based in Salt Lake City. She can be reached atelaine@ejonespr.com.